The beauty of our nature affects every one of us. Whether we’re watching a documentary about the Amazon forests or hiking in the mountains – there is something special about the views of our planet. We probably all have experienced that wonderful feeling of looking down to a vast forest from the top of the mountain. This intense feeling gives us hope, inspires us to do greater things, finally – it makes us think about the meaning of our life. Since the ancient times, nature landscapes were a great inspiration for artists, creators, and writers. Therefore, landscape tattoos resulted in one of the many inspirations of our mother nature. 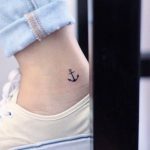 In the past few years, these tattoos became very popular. And it mainly happened because of the more advanced techniques and developed equipment of tattooing. A more accurate tattoo gun allows the artist to create more detailed and smaller designs. That’s why people started to get little and realistic tattoos. 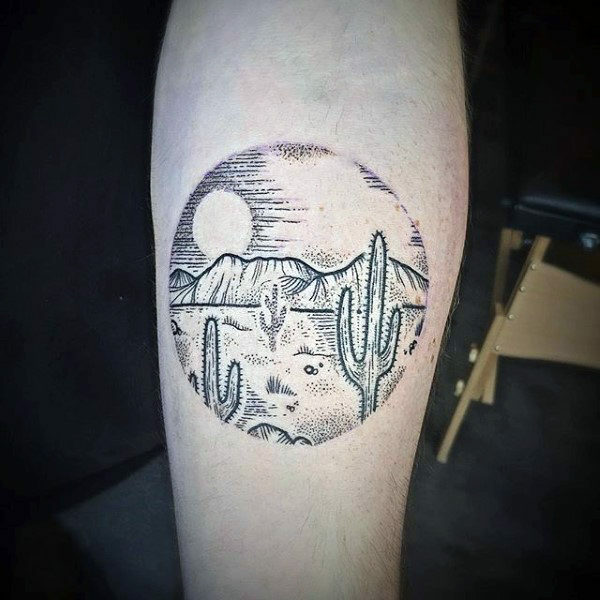 Today, landscape tattoos are no longer a hype like they were a few years ago. But that doesn’t mean they are not wonderful! Let’s take a closer look at the landscape tattoos and their meaning. And as always – don’t forget to check out our selection at the end of this article. When we talk about tattoos, we always have in mind at least some kind of symbolic meaning. And in most of the cases – tattoos are the symbols itself. For example, an OM tattoo is a Hindu symbol, and if you’re not into Hinduism, you probably won’t get it. Meanwhile, landscape tattoos are not a clear or a well-known symbol, so they don’t have a particular meaning. Every landscape tattoo means something different for each person that owns it. However, if we’d dig more into it, we will discover that landscape tattoos are popular mostly among people that love travel and exploration. Also, people that feel nostalgic or want to capture a precious memory of their homeland landscape on their body. 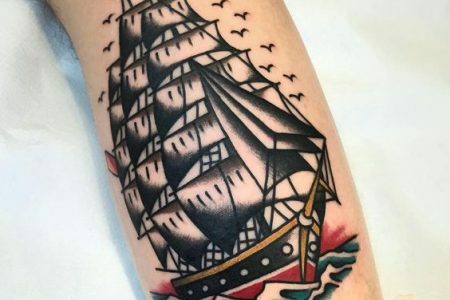 Whatever the reason, there are many meanings that landscape tattoos can symbolize. First of all, it can express your relationship with nature. 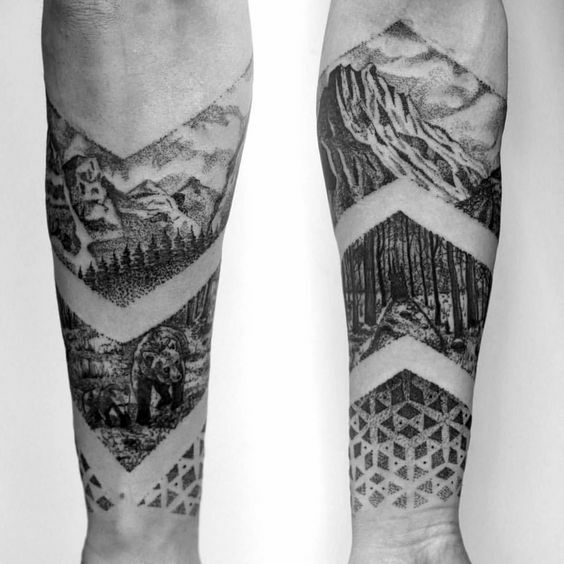 Every person who is dreaming of mountains, forests or seas should consider getting a landscape tattoo. Not only it will reveal your love for nature, but it will also remind you of what is most important to you. It may be an excellent reminder to get out of the city once in a while to clear your mind. 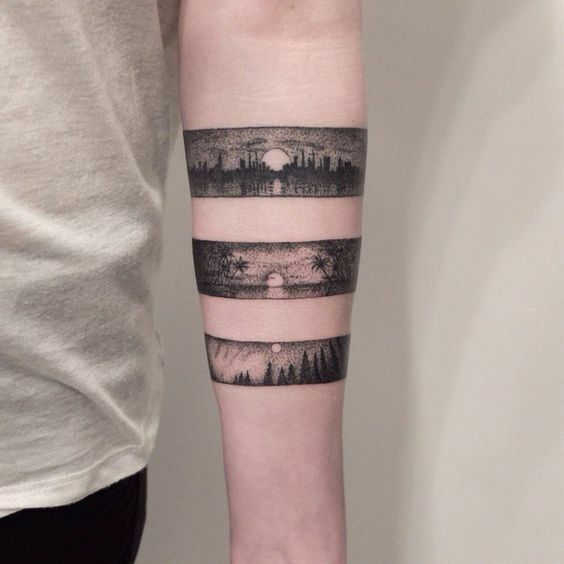 Another meaning of landscape tattoos is much more personal than the relationship with nature. When you’re far away from home, your homeland’s landscape will remind you of your family or parents. It can also be a place where you’ve experienced the most beautiful moments of your life. 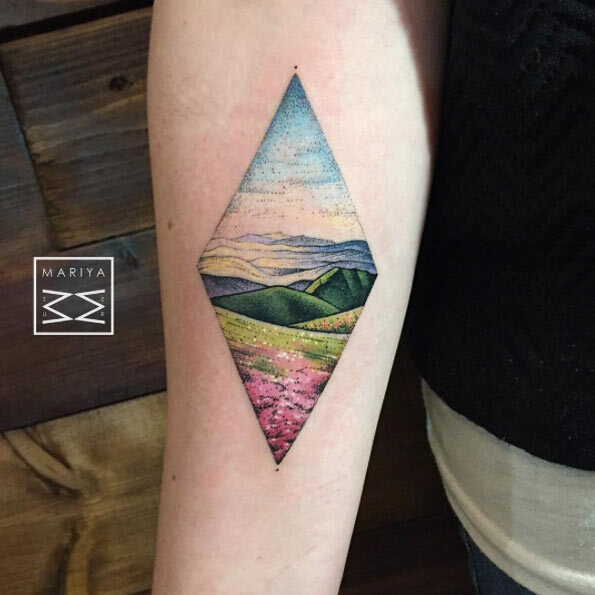 A landscape tattoo can connect you with your childhood memories, your first kiss, family trip, etc. Finally, it can just be a picture of beautiful scenery that you’ve captured with your camera while traveling. Our nature is various in many ways. In different parts of the world, we discover unique and mesmerizing landscapes. Choose from a jungle, forest, mountain, sea, lake or even city accordingly to your inner beliefs. 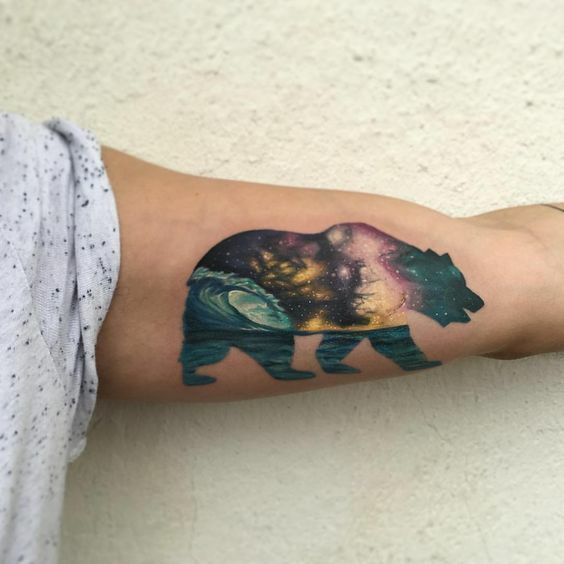 Take a look at these different landscape tattoos below. Each one of them is unique in its way and can add even more meaning to it. Like on the piece of paper, we can’t fit the whole landscape on to our body. That’s why tattoo artists usually put landscape tattoos inside geometric shapes such as circle, triangle, square, rhombus or rectangle. Most popular type is circular landscape in black and grey color ↓. The most common placement are thighs, ribs, back, and chest. 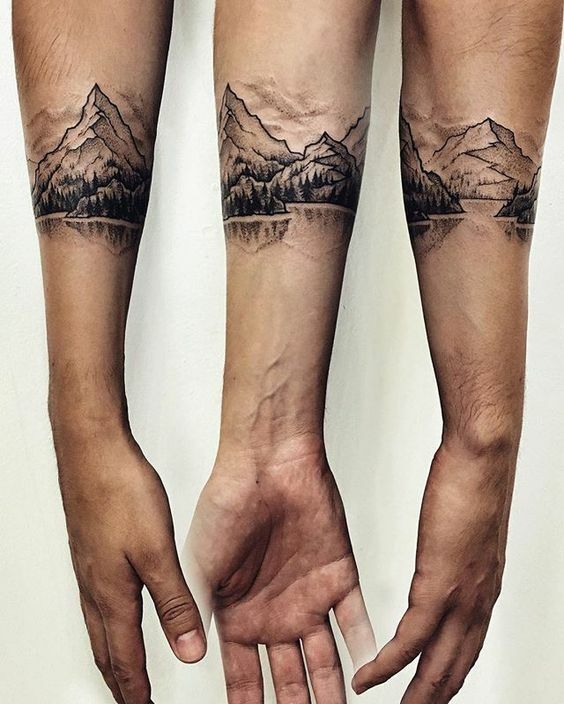 Very often, tattoo artists use double exposure to create even more fantastic landscape tattoos. They fill the landscape into another object (usually some animal ↓). 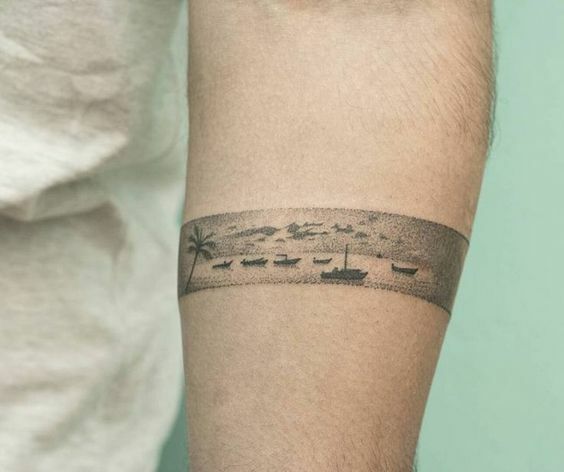 The fact that landscape tattoos don’t have any cliches (yet), makes them even more attractive. They allow us to create our meanings and stories around them. 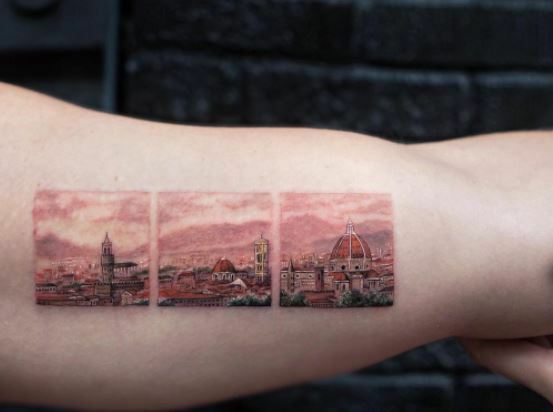 So, when you’re getting a landscape tattoo, think that you are building your own story. Don’t be afraid to add something unique that is important to you. After all, the most significant works of art were the result of experiment and new ideas.